While we are all focused on our own weight loss journeys, green or vegan foods and our environmentally-friendly footprint, we may be looking past the health of our furry and four-legged friends who have become an inseparable part of our family. Obesity a global and common problem affecting almost half of the global population is something that happens in pets as well, not just people. Every day we are being bombarded with obesity epidemic all around the world. Unfortunately, this is something that affects our pets, not only humans. According to some unpleasant statistics, more than half of dogs are overweight and one fourth of dogs are obese. As with people, animals’ weight can go up and down but it’s important to know and follow the ideal weight for your beloved pet just as for yourself. As with their human counterparts, the underlying cause why dogs get fat is simply because they eat too much and exercise or move around too little, especially in the scorching Dubai sun. 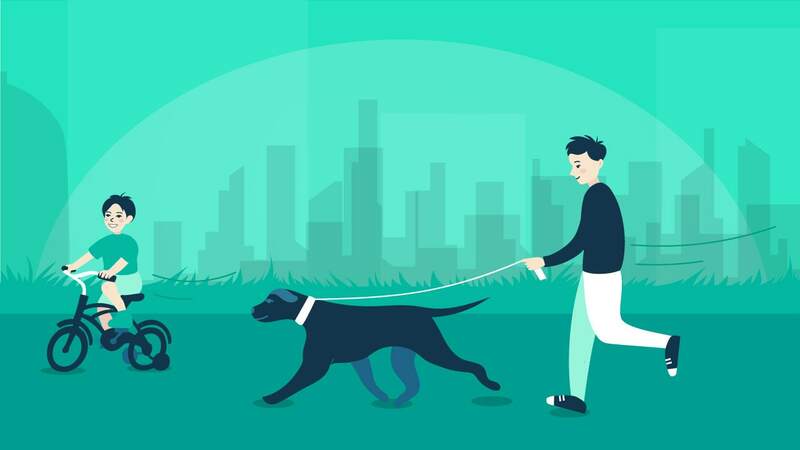 But unlike their human pet owners, dogs love their walks as much as they love treats –– and such walks can go a long way toward losing weight and reducing the risks associated with it. There are many reasons that could potentially stimulate obesity in pets such as: unhealthy eating habits, foods containing high-calories, receiving treats more than they should, neutering, irregular diet schedules and inability or lack of exercise. There are also high chances for pets to start gaining weight if they have a pre-existing tendency to retain weight and or due to the environment they live in. Dogs can suffer from obesity regardless of their age, but it is comprehensibly more common in less active pets. Health problems caused by obesity can include but are not limited to heart diseases, a shortened life span, ruptured ligaments, hard breathing, greater risk for heat stroke/heat exhaustion, and many others. All of these are serious consequences which affect not only your dog, but you as well. Promoting and encouraging healthy habits and frequent activities are a must and highly beneficial for your four-legged friend. You can find out more ideas and advises on popular sites such as help4u.today where you can join a community of dog owners who share your challenges and you can read more on how to keep your dog and yourself in shape and still be able to finish off all your activities. You can also suggest these ideas to your professional dog walker in Dubai and set up a plan for him to follow while you have your piece of mind. 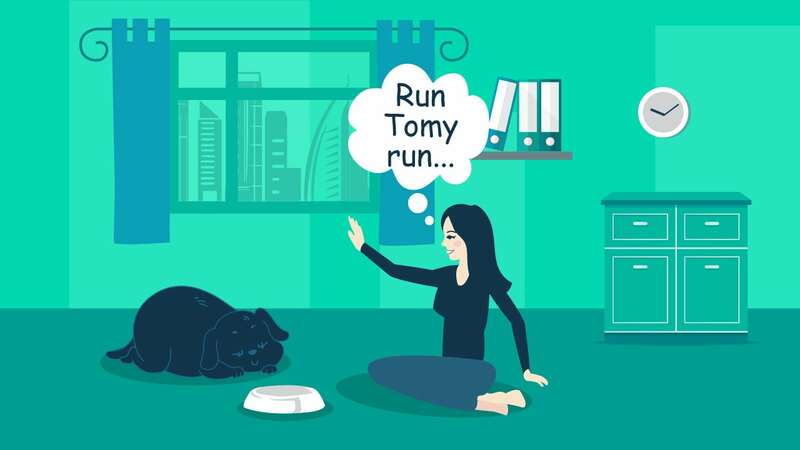 We all know that creating and executing an effective weight loss plan for a dog isn’t a simple walk to the park, the formula for managing a pet’s weight is pretty straightforward simple: if calories burned exceed the consumed ones in food and treats, your pet will be slimmer. Much of the challenges lies in the fact that we’re often not familiar enough with the requirements and practices our pets’ daily regime needs. Additionally, it’s hard to get accurate calorie information from some pet food labels, and this is just another headache for dedicated pet owners. In addition, if more family members spoil and feed or give your pet treats, it becomes even more complicated to monitor your dog’s intake. Experts do advise that before you visit the vet, you should try and get a handle on the volume of food and treats your pet takes in during the day for more accurate guidelines on how the weight-loss process shall be done. Let’s talk food - Don’t free feed! Treats feeding – relying on your pet to decide when he is full by providing a full bowl during the day might look like a good idea if your pet is not keen on overeating. But dogs are dogs and this can lead to overeating and pet obesity – especially if your pet is bored during the day. Dedicate a small portion of your time to teach family and friends to avoid giving your pet table scraps and to limit treats. Keeping a record of your dog’s weight is also a good idea. If possible, checking the weight once per week would be of great help to track the progress. To keep your dog from begging for food, feed him or her before you sit down to have your own meals. Most dogs perform quite well with being fed 2-3 meals daily. Meal sizes should match the needs of individual animals, not just based on body weight and definitely not stimulated by sad-looking eyes or joyful tale waving. Physical activity is crucial step in keeping your dog fit and healthy. Give dogs some exercise benefits from running and chasing around the apartment, also a morning pet walk in Dubai will definitely help keep their weight in the healthy range. Plus, it’s good exercise for you, too. 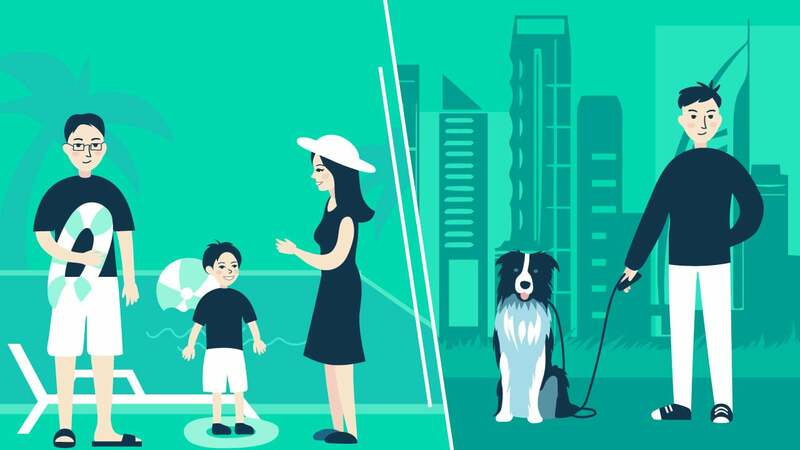 However, if you don’t have time to walk your friend yourself, our platform allows you to compare morning pet walk quote. Weight Management. Cooperate with your vet in regulating what is the approximate weight your pet needs to lose and in creating a plan to achieve that goal step by step, with plenty of small triumphs along the way. This will increase his quality of life. Always stay prepared for setbacks. Dogs may sometimes refuse diet food or simply wine and beg for table scraps. Stay focused and mentally prepared to solve problems as they arise. * Make the whole process fun. Your vet shall probably schedule periodic check-ups to track your dog’s progress. Make these playful and fun. Each time you visit vet, treat your four-legged busy and schedule an extra walk in the park. For every goal your pet reaches, go to the pet store for a new toy. Be sure to take “before” and “after” photos to lift morale and inspire other pet owners facing similar challenges. Be sure to share your success stories on help4u.today, the most popular services aggregator in Dubai and the UAE. 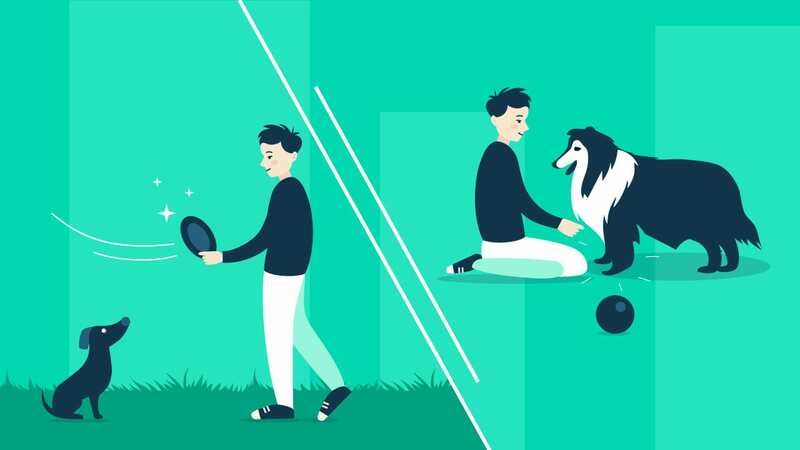 Share your experience and offer some practical tips for people who are in your shoes and who are facing the greatest dilemma of all – to treat that successful fetch or not. * Always have the “big picture” in your mind. While it is difficult to resist your pet when begging for treats, failure in this process is far worse. By reminding yourself about the health impacts for your dog, you’re less likely to return to your old habits. Many pet owners are facing similar questions on how to improve the health of their pets. For busy dog lovers, booking a professional pet sitter in Dubai can be an excellent pet exercise solution. When people see the term “pet sitter,” many of them associate it with a person who watches pets while owners are on holiday, but the reality is that pet owners depend on professional pet-sitting services for much more than occasional travel. By obtaining the right input and guidelines by the owner, setting a vet-approved dietary regime and with pet obesity constantly on the rise, booking the services of professional dog walkers is becoming more popular than ever before in providing beloved dogs with the pleasure of additional daily playtime and helping them maintain a regular feeding schedule. You will have your peace of mind just as a bonus. Many professional pet-sitting businesses in Dubai also offer daily dog-walking sessions, while some even offer other services to help keep dogs active such as sand dunes hiking or swimming. Getting our beloved dogs out with a professional dog walker in Dubai can combat the extra weight by putting miles on their paws, as well as cheer up their days and improve their emotional wellbeing. Some people think that keeping an overweight dog is interesting, appealing and sometimes even funny but reality is that if you have an overweight animal, you are putting it in serious risk of danger for a series of health issues. Sometimes the neighbourhood one lives in can limit the availability of where outside you can go for a walk or to play because it is simply too hot, however it’s important to work around obstacles towards a happier and healthier dog. Exercise is also raising your happiness levels too. As pet owners, you should always do whatever is in your power to ensure the health and safety of your furry little friends because they are as extensions of your family, so you should never want to put a loved one at risk, whatever the challenges faced. Finally, there are many interesting ideas, credible comments and options to choose from on help4u.today, the popular website for booking services in Dubai and the wider UAE region. Check it out and maybe you will find something that both you and your dog will enjoy doing and will get the stay-in-dog-shape job done.